You will probably never believe me when I say that I've never owned a stripey tee until today, but whatevs it's true. I bought it on my lunch today because I wasn't hungry due to this stooopid cough that just won't do one, so yeah as you do... You buy clothes instead. Normally I would do both. Shop then eat. 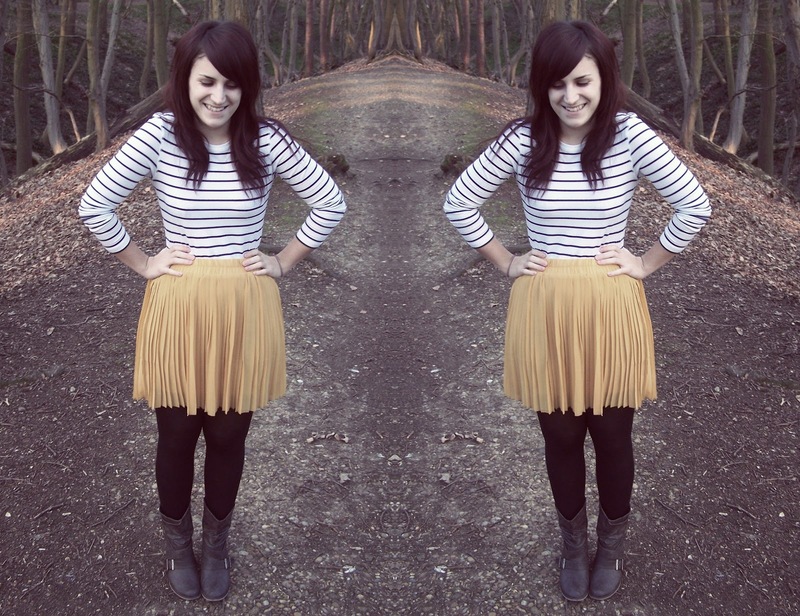 When I (sorry Mama Mcfred) bought me this skirt at the weekend, I had in mind stripes.. But I was held back. I have a fear of stripes (along with denim, and buttons). Not literally a fear of them, more so that every time I try one on I look double the size. So when I saw this one by the front door of H&M I had to try it on. Try it on like I did the 483 times before. And right there and then for once, I decided enough was enough. I had to man up. Eat less. And buy it. I'm such a daredevil. To be honest, I'm not quite sure if it was the £5 price tag or the fact it was an age 12 that made me feel happy inside. Either way, mission accomplished. I wore it. But when I saw the mini eggs tonight, it 'accidentally' got lost.